The New Ruler booster is a Japanese Booster Pack in the Yu-Gi-Oh! Official Card Game (OCG). 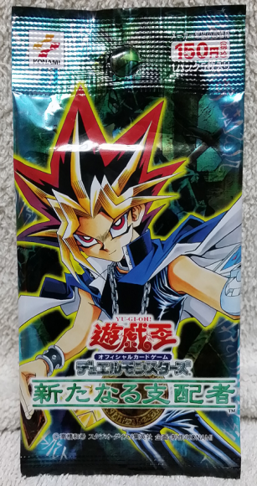 It is the first Booster Pack in the OCG Series 3. This is the first Booster Pack to use three letter abbreviations for the set ID and use the order number, rather than a shorthand of the set's name. In other languages, The New Ruler and the Japanese Pharaonic Guardian are amalgamated into another set called Pharaonic Guardian. It contains cards like "Helpoemer" and "Coffin Seller", the first appearance of the "Gravekeeper's" monsters, many cards used by Dark Marik, in the manga, and an Ultimate Rare reprint of "Red-Eyes B. Dragon". This page was last edited on 13 March 2019, at 13:13.